A lush pictorial history of Hollywood costume designer as a Cinephile and fashion editor the coffee table book “Creating the Illusion” has become a guide and style reference point. 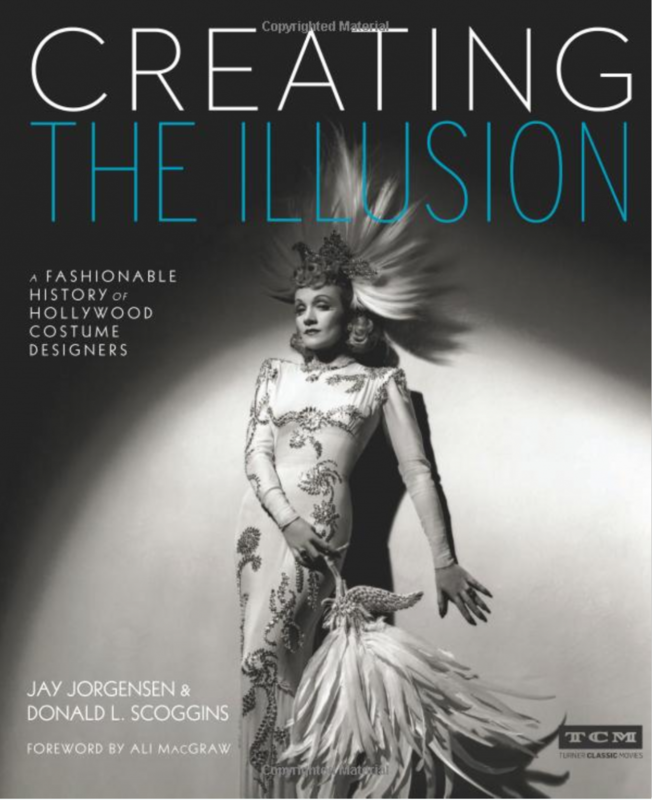 Starting from the genesis of the film industry to the modern day, authors Jay Jorgensen and Donald L. Scoggins give in depth narratives of craftspeople responsible for creating cinema’s most iconic looks by helping performers build characters that would make them famous on silver screens around the world. Informative as well as entertaining from Page 1, Chapter 1 “Creating the Illusion” weaves together fascinating features with pictures, illustrations, and narratives on the giants of the field; Head, Adrian, Plunkett, Kelly, Louis, and Banton. But also included are stories of artist Erte and fashion designer Chanel forays into film costume design. Without skipping the spotlight shines on other well-known equally talented figures including Irene, Rose, and Travilla to name a few. A vast number of films are discussed from “Salome”, “Gone with the Wind” to “The Matrix” mixed with behind the scenes anecdotes involving studios, directors, and movie stars; Liz Taylor’s gold costume from “Cleopatra” or the battle of wills involving Marilyn Monroe against Fox, and Dietrich’s iconic jewel encrusted dress from “Angel” are just some of the fascinating stories involving designers caught in the political maneuverings of movie making. If you have a collection of cinema books or fancy yourself as a film buff I recommend “Creating the Illusion”. I had so much fun while inspired reading about relationships between costume designers have with movie stars and their involvement in the creative process of film production. Creating The Illusion is available at your local bookstore or on order from Amazon. Separator image Posted in Book Review, Cinema, Fashion and tagged with berlinfashionweek, Book review, cinema, costume design, costume designers, Fashion, film buff, filmmaking, hollywood, old hollwood, tcm.